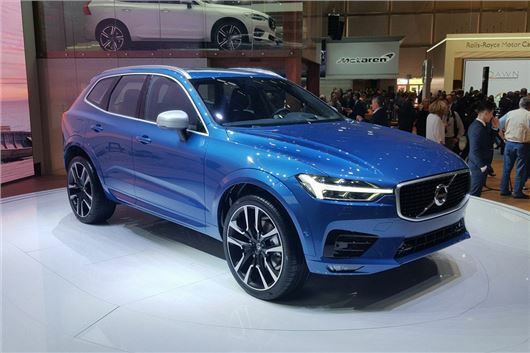 The all-new Volvo XC60 has been revealed at the 2017 Geneva Motor Show. Sales will start in mid-2017, with pricing expected to kick off at around £30,000. Like the larger XC90, the new XC60 is fitted with plenty of advanced safety technology including autonomous emergency braking and a semi-autonomous driving system for motorways, which will automatically bring the car to a stop in traffic jams. The engine range is shared with other Volvo models including the S90, with a 407PS T8 Hybrid at the top of the line up. The 190PS D4 and 235PS D5 diesels are likely to find more buyers, though – plus there is a T5 petrol with 254PS. From launch all engines come with an eight-speed automatic transmission and all-wheel drive as standard. There is also a more powerful T6 petrol, but there are no plans to sell it in the UK. Inside, the XC60’s cabin has the same layout as the XC90, with a large central touchscreen system to control navigation, connectivity, audio and ventilation. Material quality is top notch, as is typical for the latest Volvos, plus there are plenty of customisation options, including a selection of veneers and upholstery colours. Gone are the days when Volvo used to be boxy, although they did also get a bit weird recently with the kind of flowing designs. This white the new head lights and lovely cabin seems to tick all the box's Job done Volvo but whats the cost? How deep do my pockets need to be to own this?